Passion. Belief. Optimism. Courage. Commitment. Certainty. Faith. These are the forces that animate a new venture as well as fuel and sustain entrepreneurs through the ups and downs of the startup journey. But these same qualities, when magnified or misdirected, can lead to unhealthy business behaviors—to rose-colored planning, unwise commitments, entrepreneurial blind spots, overly rigid strategies, or to a catastrophically bad fit between the skills and motives of a founder and the needs of the new business. In 6 Secrets to Startup Success, entrepreneur and investor John Bradberry offers a breakthrough explanation for why so many startups fail, and provides ready solutions for aspiring founders. The book’s core premise is that entrepreneurial passion is a double-edged sword, both vital and dangerous to the venture. By sharing compelling startup stories and broad research findings, Bradberry explains what happens, for better or worse, when founders fall in love with their ideas. The book introduces the concept of The Passion Trap, a pattern in which an entrepreneur’s emotional attachment to his or her venture can limit and endanger their efforts. More importantly, he outlines six key principles that can radically improve a venture’s odds of success, principles that will ensure that founders bring the very best of their passion while avoiding major risks and traps along the way. What can new entrepreneurs learn from brain scans of Franciscan nuns in prayer? What are the six negative effects of entrepreneurial passion, and what can founders do to prevent them? Why do passionate founders rarely hear honest feedback about their ideas? Why do moderately optimistic founders outperform extreme optimists? Why do twice as many successful tech entrepreneurs start ventures in their fifties as in their twenties? How did passion cause a talented entrepreneur to make $8 million and lose $8 million in the same year? What kind of career experience matters most for aspiring entrepreneurs? Which reasons for starting a business pack the most motivational power? When did Steve Jobs’ legendary passion get the best of him? 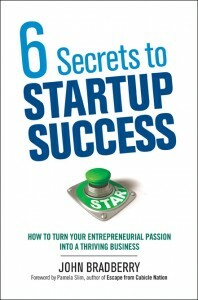 Click the links to download PDFs of the Table of Contents and Chapter 2 of 6 Secrets to Startup Success.